3rd Bn. Hq. Com. 28th Inf. V-Mail was a photocopy of a written message. This allowed the Army Postal service to get a great many letters on just a few rolls of film, fly that film out to the troops and then print them back out as letters. V-Mail saved the Army from moving tons of paper letters overseas to the servicemen. 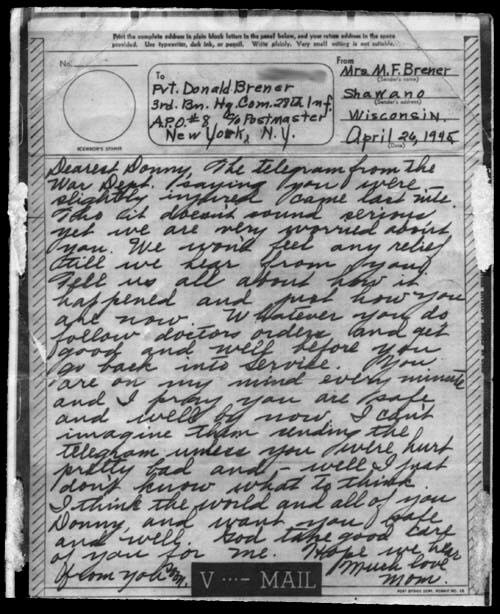 This one is from Buck's mother to her "Donny" the day after she received a telegram reporting he had been "slightly" injured. It must have been very hard on the whole family to get that kind of news. The telegraph delivery boy was not a welcome sight in those days. Buck told me that a German tank had surprised them while they were laying telephone wires in a town. They tried to hide in a house when a near miss by the tank's cannon smashed Buck with the concussion from its explosion. He couldn't move and had to stay behind. They hid him under a pile of potatoes in the cellar of the house and retreated. The Germans moved in and reoccupied the town but somehow didn't find Buck when they searched the basement. They set up a command center right upstairs in the very same house. A woman came down to the cellar for potatoes once and spotted him. She put a finger to her lips and signed to him to keep quiet. He waited for days before the Americans finally recaptured the town and rescued him. He was hospitalized and supposed to get shipped home. But he left the hospital to rejoin his buddies and finish his war.